The Red Line is a rapid transit line of the Washington Metro system, consisting of 27 stations in Montgomery County, Maryland, and Washington, D.C., in the United States. It is a primary line through downtown Washington and the oldest, busiest, and longest line in the system. It forms a long, narrow "U", capped by its terminal stations at Shady Grove and Glenmont. Montgomery County, MD and Washington, D.C. Trains run most frequently during morning and evening rush hours (nominally four to eight minutes apart) and least frequently after 9:30 p.m. (nominally 15 to 18 minutes apart). The Red Line is the only line in the system that does not share its tracks with another Metrorail line. However, it runs parallel to the Metropolitan Subdivision between Washington Union Station and Silver Spring as well as between Twinbrook and Shady Grove stations. These tracks used to be part of the former Baltimore and Ohio Railroad route. The MARC commuter rail system uses this parallel route with stops in Silver Spring and Rockville when traveling between Washington and Martinsburg, West Virginia, while Amtrak uses this parallel route with a stop in Rockville when traveling the Capitol Limited route between Washington and Chicago Union Station. (video) A Red Line train coming into Takoma station on a snowy day in 2018. Planning for Metro began with the Mass Transportation Survey in 1955 which attempted to forecast both freeway and mass transit systems sufficient to meet the needs of 1980. In 1959, the study's final report included two rapid transit lines which anticipated subways in downtown Washington. Because the plan called for extensive freeway construction within the District of Columbia, alarmed residents lobbied for federal legislation creating a moratorium on freeway construction through July 1, 1962. The National Capital Transportation Agency's 1962 Transportation in the National Capital Region report anticipated much of the present Red Line route, with the Red Line following the Baltimore and Ohio Railroad right-of-way between Silver Spring and Rockville instead of a direct route between Bethesda and Rockville. The route continued in rapid transit plans until the formation of WMATA. With the formation of WMATA in October 1966, planning of the system shifted from federal hands to a regional body with representatives of the District, Maryland and Virginia. Congressional route approval was no longer a key consideration. Instead, routes had to serve each local suburban jurisdiction to assure that they would approve bond referenda to finance the system. Because the least expensive way to build into the suburbs was to rely upon existing railroad right-of-ways, the Red Line took much of its present form, except that it continued to feature a further link between its two stems along the Baltimore and Ohio Railroad right-of-way. By 1969, WMATA had decided on the current routing and stations, except for the extension beyond Rockville to Shady Grove. Montgomery County officials opposed ending the Red Line in downtown Rockville, saying it would cause congestion in the area and use scarce vacant land for a storage yard. Metro decided to propose to extend the red line one more station to Shady Grove and the U.S. Department of Transportation conditionally approved funding for the extension on July 26, 1975. Construction on the Red Line began with a groundbreaking ceremony at Judiciary Square on December 9, 1969. Construction proved difficult because the National Park Service prohibited a bridge across Rock Creek and required that the Red Line tunnel under that valley, the tunnel in turn caused both the Dupont Circle and Woodley Park stations to be built further underground. The Red Line was proposed to tunnel under Yuma Street from Connecticut Avenue to Wisconsin Avenue, but local residents sued and that court case delayed construction of the tunnel for two years, then WMATA finally won the right to build the tunnel there. Service on the Red Line (and the Metro as a whole) began on March 27, 1976, with operation between Farragut North and Rhode Island Avenue. Gallery Place's opening was delayed due to a court order regarding lack of handicapped access, but it opened in the middle of the line on December 15, 1976. The western end of the line was extended one station to Dupont Circle on January 17, 1977, three stations to Van Ness–UDC on December 5, 1981, five stations to Grosvenor–Strathmore on August 25, 1984 and four stations to Shady Grove on December 15, 1984. The eastern end was extended four stations to Silver Spring on February 6, 1978—which added Maryland to the system for the first time — two stations to Wheaton on September 22, 1990, and one station to Glenmont on July 25, 1998, completing the line. 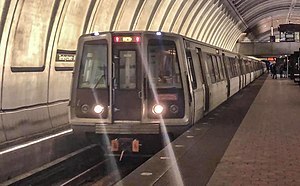 The only time the Red Line shared tracks with another line was from January 27, 1997 to September 17, 1999, when the Green Line Commuter Shortcut used Red Line tracks from Brookland–CUA to Farragut North. A short time after the Green Line branch north of Fort Totten opened in the early 1990s, the "Green Line Commuter Shortcut" began as a six-month experiment. Passengers could board the Green Line between Greenbelt and West Hyattsville and travel as far as Farragut North without having to transfer; the trains bypassed Fort Totten via a single-track spur between the West Hyattsville and Brookland–CUA stations. Due to its success, the shortcut continued until the mid-city portion of the Green Line was completed in 1999. The NoMa–Gallaudet University station (formerly New York Ave–Florida Ave–Gallaudet University), located between Union Station and Rhode Island Avenue–Brentwood, opened on November 20, 2004. It was the system's first infill station (i.e., a new station built between existing stations). On November 3, 2004, an out-of-service Red Line train rolled backward into the Woodley Park – Zoo / Adams Morgan station and hit an in-service train stopped at the platform. No one was killed, but 20 people were injured. A 14-month investigation concluded that the train operator was most likely not alert as the train rolled backward into the station. Safety officials estimated that had the train been full, at least 79 would have died. The train operator was dismissed and Metro officials agreed to add rollback protection to more than 300 rail cars. On the evening of June 22, 2009, at 5:03 p.m., two Red Line trains were reported to have collided when traveling between the Takoma and Fort Totten Metro stations. A stationary train was struck from behind by a second six-car train, resulting in the telescoping of the moving train onto the rear of the stationary train. Nine people were killed in the collision (eight passengers and the train operator) and at least 70 people were injured. It is the deadliest accident in the history of the Washington Metro. The National Transportation Safety Board report on the accident was released on July 27, 2010, which blamed a faulty track circuit, part of the automatic train control system, for causing the crash. WMATA made a press release detailing changes on July 26 in anticipation of the release. Below is a chronological list of dates on which specific portions of the Red Line opened for service. From Gallery Place through Judiciary Square, the line runs southeast, turning east again at D Street to reach Union Station. There it turns north and surfaces adjacent to Union Station's platforms, follows the Washington Terminal yard tracks north to Brentwood where the line turns northwestward and again joins CSX Transportation's Metropolitan Subdivision tracks, running in a unique gauntlet arrangement with the freight railroad tracks straddling the Metro tracks. The Red Line continues in this manner northwest across the DC-Maryland line, through Takoma and past Silver Spring. It reenters a tunnel at 16th Street and heads north under Georgia Avenue to the end at Glenmont. :188 There is a maintenance yard between the NoMa–Gallaudet and Rhode Island Avenue–Brentwood stops. Internally, WMATA calls the Red Line the Shady Grove Route (A) and the Glenmont Route (B), which meet at Metro Center. The Red Line needs 44 trains (10 eight-car trains and 34 six-car trains, consisting of 284 rail cars) to run at peak capacity Trains run most frequently during morning and evening rush hours (nominally four to eight minutes apart) and least frequently after 9:30 p.m. (nominally 15 to 18 minutes apart). The Red and Green Lines are the only ones that do not enter Virginia. In November 2010, WMATA authorized $37 million in capital improvements on the Red Line. This is a part of $212 million of work on the Red Line scheduled over 2010–2014. In December 2009, WMATA began construction of a new 1,200-car parking garage to supplement the existing 1,700-car parking garage at the Glenmont station. The new garage opened in April 2012 and was funded by the State of Maryland. On the east side of Rockville Pike, a new entrance to the Medical Center station is under construction, as well as a pedestrian tunnel under Rockville Pike to connect the entrance to the station. Currently, about 7,000 riders per day emerge from the station on the west side of the Pike, then cross the busy six-lane road to reach the Walter Reed National Military Medical Center. In September 2009, Montgomery County submitted a $20 million federal grant application. Construction would have originally occurred in 2011, but the project was not approved until 2013. The project is fully funded at $68 million, mostly through the Department of Defense, and includes installation of new deep elevators, improvement of surface bicycle and pedestrian facilities, as well as an extension of the left turn lane on southbound MD 355. The project began construction in December 2017, and is expected to be completed in late 2021. ^ a b "Timetables | WMATA". www.wmata.com. Retrieved 2019-04-18. ^ "Washington Metropolitan Area Transit Authority Compact" (PDF). WMATA. August 2009. Retrieved March 28, 2018. ^ "D.C. Area Transit Compact Approved". The Baltimore Sun. October 14, 1966. p. A10. ^ Financing Subway System for National Capital Region: Joint Hearings Before the Committee on the District of Columbia and the Subcommittee No. 4 of the Committee on the District of Columbia. 1969. p. 129. ^ a b Eisen, Jack (July 27, 1975). "Rockville and Greenbelt Lines Are Funded by U.S. for Metro". The Washington Post. p. 9. ^ "WMATA History" (PDF). WMATA. Retrieved March 28, 2018. ^ Schrag (2006), p. 151. ^ Schrag (2006), p. 160. ^ Rosenthal, Harry (March 26, 1976). "First section of new subway system opens". Daily News. p. 14. Retrieved December 11, 2010. ^ a b c d e f "Sequence of Metrorail openings" (PDF). Washington Metropolitan Area Transit Authority. 2017. p. 3. Retrieved March 28, 2018. ^ "Metro - Community Outreach - Lunchtalk Online Chat". WMATA. March 6, 2009. Archived from the original on July 29, 2012. Retrieved March 3, 2011. ^ "Metro's New York Ave-Florida Ave-Gallaudet U Metrorail station opens today on the Red Line". WMATA. November 20, 2004. Retrieved March 28, 2018. ^ Layton, Lyndsey; Steven Ginsberg (2004-11-04). "20 Injured in Crash of 2 Red Line Trains". The Washington Post. pp. A01. Retrieved 2009-01-27. ^ Saslow, Eli (June 28, 2009). "Three Minutes to Fort Totten". The Washington Post. Retrieved June 30, 2009. ^ "Fatal Washington Metro Crash Shows Need for U.S. Transit Rules, NTSB Says". Bloomberg. July 27, 2010. Retrieved July 28, 2010. ^ "Washington Metropolitan Area Transit Authority Rear-end collision: Accident Report Detail". NTSB. May 17, 2012. Retrieved March 28, 2018. ^ "Metro demonstrates safety commitment, compliance with NTSB recommendations, including replacement of 1000 series rail cars" (Press release). WMATA. July 26, 2010. Retrieved March 28, 2018. ^ a b c "Metro Draft Environmental Statement". WMATA. February 1973. Retrieved March 28, 2018. ^ "WMATA Red Line". www.nycsubway.org. Retrieved March 28, 2018. ^ "Approved Fiscal 2009 Annual Budget" (PDF). Washington Metropolitan Area Transit Authority. 2009. p. 80. ^ "Metro System Map" (PDF). WMATA. Retrieved March 28, 2018. ^ "Overhaul of the Red Line continues". WMATA. November 18, 2010. Retrieved December 10, 2010. ^ Reed, Dan (April 26, 2012). "Can a parking deck be "green"? New Glenmont garage isn't". Greater Greater Washington. ^ Parcher, Amber (November 11, 2009). "Metro unveils design for Glenmont parking garage". Montgomery County Gazette. Retrieved December 10, 2010. ^ Waibel, Elizabeth (February 13, 2013). "New entrance, pedestrian tunnel planned for Medical Center Metro". Montgomery County Gazette. Retrieved April 21, 2013. ^ Ujifusa, Andrew (September 16, 2009). "County proposes underpass for Medical Center Metro station". Montgomery County Gazette. Retrieved December 10, 2010. ^ "Medical Center Metro Crossing Project". Montgomery County Government. Retrieved February 11, 2018. ^ Martinez, Julio (January 11, 2018). "Tunnel to be Built for Pedestrian Use". DC Military. Retrieved February 11, 2018. ^ Brooks, Jeremy (January 11, 2018). "Progress to Continue on MD 355 Crossing Project through 2018". DC Military. Retrieved February 11, 2018. Wikimedia Commons has media related to Red Line (Washington Metro).